There's a bus named Pune Darshan that takes tourists to various sights in Pune. Rs 100 for an 8 hour ride is indeed a good deal. I did something what the bus does and something that it doesn't. My attempt is to put forth Pune from how a camera sees it. And not necessarily how a tourist would want to. Parvati: The 103 steps up were worth Rs 2195. My shoes got stolen (footwear need to be removed when entering a place of worship). Yes, up there, they do have a shoe stand but that usually is closed. I was there on a busy Sunday evening. So, take a companion along to mind your shoes! Anyway, Parvati was good even barefoot. Built by the Peshwas (erstwhile Prime Ministers in the Maratha Empire) way back in 1753, Parvati has 3 main temples. Devdeveshwar (Lord Shiva & Goddess Parvati); Shri Kartik Swami (elder brother of Lord Ganesha; females are not allowed to enter this temple's premises) and Lord Vishnu Narayan. The 4th temple is of Lord Vitthal which was built not long ago. While most of the original structures have been renovated, you do get to see the ruins. 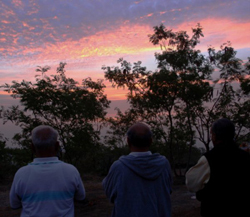 In the Devdeveshwar premises, you can walk (on payment of Rs 2) the gallery for an excellent view of Pune city beneath. When there, make it a point to visit the Peshwa museum and the samadhis (eternal resting place) of Balajirao and Nanasaheb Peshwa. You need to pay Rs 5 and Rs 2 more respectively. Chaturshringi: On Senapati Bapat road, there's this temple on the hills built for Goddess Chaturshringi. Easy steps take you up to the temple doors. Thereafter it's an easy trek. Like many, I ventured to go all the way up till I hit the plateau. That's were I saw riot of colours created by wild vegetation and Pune. The guys playing cricket up there must be a healthy lot. First, a big climb and then the boundaries. I was bowled. Hanuman Tekdi: Lord Hanuman is an inspiration to the health conscious. One can ascend this hillock from 3 sides. Senapati Bapat road (next to Symbiosis); BMCC road (next to BMCC) and Fergusson College road (through the Fergusson College main gate). The trip is a morning favourite for hundreds of early risers. I know of groups who have been meeting up there for decades together… through rain & shine; through thick & thin. As the sun rises, be witness to chanting praising the Sun God. Deep breaths and you will be ready to tackle the day ahead. 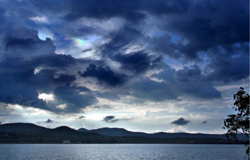 Pashan Lake: A right turn, just opposite the queen's necklace garden on Pashan - NDA road, will take you there. Let me warn you that it's dirty out there. And you won't find any visitors either. A quick in and a quick out is recommended. By all means, you may want to avoid the trip. But if you can grab the sunset, it might just be worth it. Model Colony Lake: The first left turn as soon as you cross Lalit Mahal restaurant on Fergusson College road, will bring you right here. This lake used to be a bathing place for buffaloes and also a nuisance to people living around. Thanks to the efforts of the neighbourhood, this place is now transformed into a beautiful lake surrounded by a well manicured garden and a walking track. There's an entrance fee of Rs 5 to walk around. Worth it. Lavale: In about 30 minutes, you are in a whole new world altogether. I took a left turn from Balewadi on the Mumbai Bangalore highway. A few kms. ahead, take a U-turn and follow the road uphill (for landmark keep an eye on Bandal Gantry or Mantri Alpine or a temple about 50 feet up the road). Keep going up and you will reach the edge of the valley. Down below is a very picturesque golf course. A further drive down the hill will take you to a small lake. Since this is on Western side of Pune, a trip in the evening is highly recommended. The sunset is awesome. Khadakwasla Dam: This waters fall on the road that leads to Sinhagad fort. Allow at least 45 minutes to be there from downtown Pune. A very popular destination for Puneites on weekends. A corn-on-the-cob is a must as you face the backwaters; see the dam on the right and the majestic Sinhagad fort on to your left. I was there on an overcast day. Sun and rain were playing hide and seek. I was lucky to catch a little prism effect - VIBGYOR. Kirkee War Cemetery: Take a right at Wakdewadi on Pune Mumbai road and get on Shri Sant Gyaneshwar road, erstwhile Mula road. As you move towards Holkar bridge you will see this cemetery to your right. Pay respects to the heroes of the Indian Armed Forces who laid their lives during World War I (1914-1918) and World War II (1939-1945). India has 5 war cemeteries. Madras (now Chennai), Kirkee (now Khadki), Ranchi, Calcutta (now Kolkata) and Delhi. All cemeteries put together have more than 5500 graves. Kirkee lays to eternal rest 1665 soldiers. These cemeteries are maintained by Commonwealth War Graves Commission. You will be astonished how very well the premises are maintained. Make it a point to read some of the epitaphs… it will sure moist your eyes. • August 10, 1942: Mahatma Gandhi and his colleagues were brought down from Mumbai. • August 15, 1942: Shri Mahadevbai Desai dies of heart attack. • March 19, 1943: Smt Sarojini Naidu released because of her ill health. • January 26, 1943: Mahatma Gandhi hoisted the Congress Flag at this premises. • February 22, 1944: Kasturba Gandhi passes away after prolonged illness. • May 6, 1944: Mahtma Gandhi and his colleagues were released. Fergusson College: Built on a sprawling 65 acre campus, Fergusson College has 125 years of history as the flagship of higher education in Pune. Alma Mater to leaders across the entire spectrum of societal positions: Prime-Ministers, Industrialists, Doctors, Engineers, Academicians, Scientists, Litterateurs, Artistes, and Sportspersons. Gothic structures, a botanical garden in premises and age old trees add to the charm. Pataleshwar Caves: Situated on the Junglee Maharaj road, Pataleshwar cave is a fine example of rock cut architecture. The monument is not really a cave as it has actually been carved out of living basalt. The black rock has been carved into pillars, seating areas and rooms. It's an 8th century temple dedicated to Lord Pataleshwar (God of the underworld - less you think otherwise, there are 3 worlds; below us, surface and heavens). This religious shrine has grand statues of Nandi (the bull), Lord Ram and his wife Sita his brother Laksham and a Shivalingam. 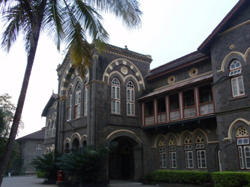 Pune University: Summer home for the Governor during the British rule is now Pune University. Established in 1948 (India got its independence on August 15, 1947), the University is spread across a sprawling campus of over 400 acres. The location is quite a favourite of walkers. At the time of writing, the main building was undergoing massive remodeling. A must visit for those who love to be amidst nature. Omkareshwar Temple: The temple is said to be constructed in the 1730s Krishnaji Pant and Shivram Bhat the spiritual guru of the Peshvas. It took about 6 years to build the temple thanks to the contribution from the public and Balaji Bajirao & Sadashivrao Chimnaji. Some records suggest that the Shivlinga was brought from the river Narmada around 1738. Situated on the banks of river Mutha, the temple was badly damaged during the floods of 1961 and was repaired in later years. The temple is unique in the sense that it is inspired by Muslim architecture - facing east, a forecourt, domes, et all. Going from Balgandharva Rang Mandir (another famous landmark of Pune), take the first right on the bridge. Omkareshwar Temple is at the right end of the bridge. Shaniwar Wada: Shaniwarwada was the stately mansion originally built as the residence of the Peshwas (Prime Ministers of the Maratha Empire). 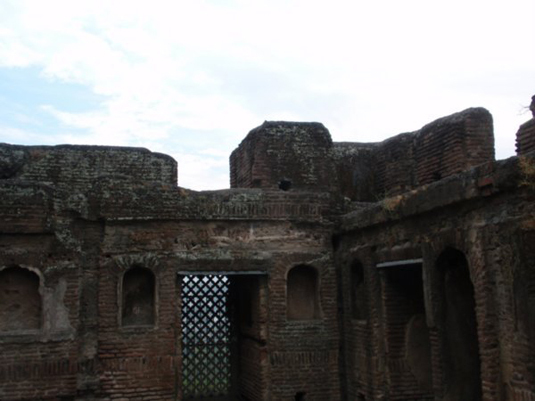 The foundation of the mansion was laid by Bajirao I in the year 1730. Construction was completed in 1732 at a cost of Rs 16,120; a very large sum those days. In today's terms that would be about $350. Several additions were made to the palace including fortification walls with bastions, gates and court halls by Bajirao's successors. What was once a seven storied structure was gutted by fire in 1828. Unfortunately, only the remains can be seen today. Mainly, the fortification walls with five gateways and nine bastions that enclosed the entire palace. The principal gate is called Dilli Darwaja (gate); the other gates are called Mastani or Alibahadur Darwaja, Khidki Darwaja, Ganesh Darwaja and Narayan Darwaja. The walls in the palace were painted with scenes from Ramayana and Mahabharata. A sixteen petal lotus-shaped fountain stands reminiscent of the exquisite work of those times. At its full glory, Shaniwarwada was home to about 1,000 people. There's a daily sound and light show. Entry ticket is Rs 25. At the time of writing, the show was discontinued for an indefinite period. Do check out. The name in itself is a Pune landmark. You wouldn't need directions… ask anybody. Lal Mahal: Shivaji's father Shahaji Shinde who was the chief of Bijapur Sultanate (more about Bijapur in my blog - Bijapur: Sound engineering) was given territories in Pune. 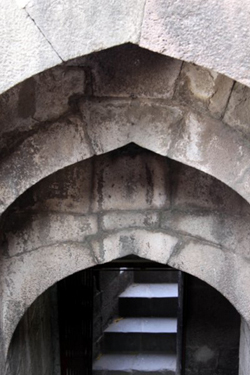 He decided to send his wife Jijabai and his son Shivaji to Pune (more about Shivaji's birthplace in my blog - Bhimashankar & Shivneri: Heavenly steps). He built a palace and named it Lal Mahal. The red brick structure stands prominently, walking distance from Shaniwar Wada. It's at Lal Mahal where Shivaji cut the fingers of Shahistikhan when he was trying to escape using one of Lal Mahal's windows. You can see many statues and pictures depicting Shivaji's life. 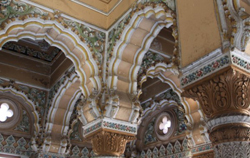 Mahadji Shinde Chhatri: Located in Wanowrie, the monument is one of the architectural prides of Pune. Adorned with intricate Rajasthani (one of the States of India) architecture, it's a memorial to the great warrior Mahadji Shinde who was the Commander-in-Chief of the Maratha army during 1760 to 1780, under the Peshwas. The entire memorial also consists of a temple, dedicated to Lord Shiva, which was built by Mahadji Shinde himself in the year 1794. He passed away in the same year. Sarasbaug & around: In the 18th century, soon after the completion of Shree Devdeveshwar Temple on Parvati hills, Nanasaheb Peshwa looked at beautification of the environs of Parvati hills. Accordingly a lake was constructed at the foothills. The lake had an island of more than 25,000 sq.ft. On this island, in 1784, Madhavrao Peshva built a temple and installed the idol of Siidhivinayak Gajanan (Lord Ganesh). Sarasbaug has now become a place of worship for people from all over the world and also a popular destination for Puneites. Saras means beautiful; Baug means garden. That's what it is. Sarasbaug welcomes over 10,000 visitors everyday. On auspicious days the number swells to over 50,000. Sarasbaug is walking distance from Swargate. Just outside of Sarasbaug is the famous Mahalaxmi temple. Mahalaxmi, wife of Lord Vishnu is the Goddess of prosperity. Side by side the statue of Mahalaxmi are also beautiful statutes of Goddess Saraswati (depicting knowledge) and Goddess Kali (depicting victory of good over evil). With lavish use of white marble stone, the temple is a typical Rajasthani architecture. The temple gets special significance during the Navratri (9 days before Dassera day) as also during Diwali. Behind Sarasbaug is Peshwe Park. A must visit for children. National War Memorial, Southern Command: It was first built in 1988 by the collective efforts of citizens of Pune. After much renovation, the museum was again dedicated to the nation on December 16, 2008. The memorial is built amidst beautifully landscaped garden. A 25 feet pillar represents the memorial. Just a km. down the Southern Command HQ, you will witness the names of soldiers who made supreme sacrifice during various wars since India's independence in 1947. Notably, you will carved on the plaques are details of Operation Polo (liberation of Hyderabad, 1948); Operation Vijay (liberation of Goa, 1961); First Indo Pak War (1965); Second Indo Pak War (1971) and Operation Pawan (1987-89, Sri Lanka). I was there at 6 in the evening, the time to hoist the 5 flags down. The flags will be hoisted up again at 6 in the morning. It was exciting to see 5 soldiers march to the flags and back. This happens every single day of the year… rain or shine. A Vijayanta Tank is also on display. A visit is a must… the least one can do is to pay homage to the martyrs. 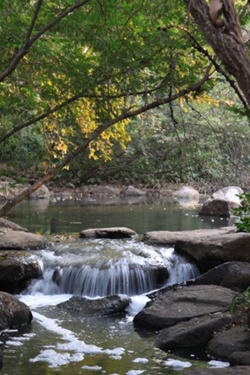 Osho Teerth - Nala Park: In the plush Koregaon Park, prime residential area of Pune is Osho Ashram. That in itself is a destination but then you need to have valid passes to get in. Just behind the ashram is Osho Teerth, more popularly known as Nala Park. Nala means a small stream. In this case, it was actually sewage water cutting across Koregaon Park. Few years ago, the Osho management adopted this stretch of land from the local authorities and converted that into a beautifully landscaped garden. The park is open from 9 AM to 6 PM every day and entry is free. A visit is recommended. Pune Okayama Friendship Garden - P L Deshpande Park: Quite the opposite direction of Nala Park, but equally good if not better. Situated on the Sinhgad road just near the Rajaram Bridge, the garden was developed by the Pune Corporation with design and inspiration from the Japanese Korakuen Garden in Okayama City, Japan. Spread across 10 acres, the space has been beautifully landscaped reminding you of the land of the rising sun. Streams cutting across plush greens, gazebos coffee plantations, bamboo bridges and shrubs make the park a welcome. Thankfully, there's an entrance charge of Rs 5 that helps keep the park maintained and under vigilance. Rajiv Gandhi Park: Located on the Pune Satara road, about 8 kms from Swargate bus stand, this zoo and snake park combined is a good place to spend a couple of hours. To be honest, I was more impressed by the sprawling acreage than the species within. Highlight of the trip was the white tiger, tiger and the leopard enclosure. Though I was keen to take a look at the king cobra, I was unlucky as that majestic snake was tucked in a far corner of his special glass enclosure. Entrance was just Rs 10 per adult (and it's Rs 2 during the world wild life week that falls from 1st to 7th October). The park has a nice lake that's closed for boating (at the time of writing) since the authorities had spotted a crocodile. It's still a mystery as to how the reptile got in! Avoid Sundays because it was quite crowded when I was there despite the school holidays being over. Wednesday is park's weekly holiday.